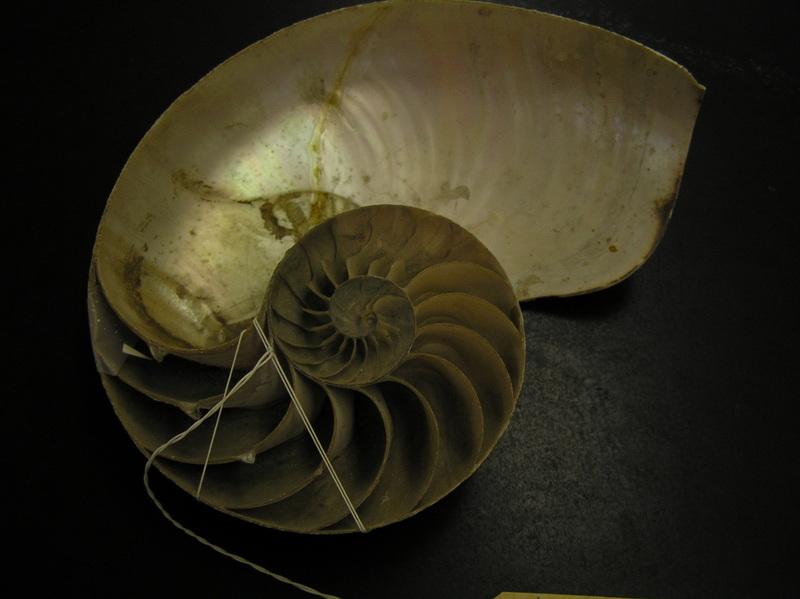 The Nautilus is the only species of living cephalopods with a coiled planospiral shell. The shell can reach a diameter of 20cm with irregular orange-brown stripes that are bilaterally symmetrical. The Nautilus has internal gas-filled structures called camerae that are divided into separate compartments by septa. The last chamber houses the living animal. The head and foot region of the Nautilus is composed of tentacles surrounding the mouth with laterally-placed eyes. Below the tentacles is a huponome that is used to locomotion. Respiration is carried out through the use of a siphon that brings water over the gills. The Nautilus is a mobile hunter that is able to grab and trap food (crustaceans, fish) and manipulate it into its mouth. The Nautilus lives in the tropical waters extending from the Andaman Sea east to Fiji and from southern Japan to the Great Barrier Reef. It can be found at depths from 900 to 2,000 feet. Nautilus are very ancient creatures and fossils of similar species can be used as evidence when determining evolutionary history and taxonomic relationships. "Chambered Nautilus". Smithsonian National Zoological Park. Retrieved from: http://nationalzoo.si.edu/animals/invertebrates/facts/cephalopods/factsheets/chamberednautilus.cfm. "Nautiloida". University of Bristol. Retrieved from: http://palaeo.gly.bris.ac.uk/palaeofiles/fossilgroups/cephalopoda/nautiloidea.html.